Following a mega 2018, the start of 2019 is a time for regrouping and recharging and writing new material. That means I don't have a tonne of stuff booked in, other than my usual Bad Language compering. That won't last forever, and already I can hear the delicate patter of stampeding projects coming my way. If you want to book me for something, scroll down. In the meantime, here are my last few gigs of 2018 so you have an idea of what I've been up to recently. "Fat Roland is a comedic onslaught of musical puns, cultural references, and audience interaction... 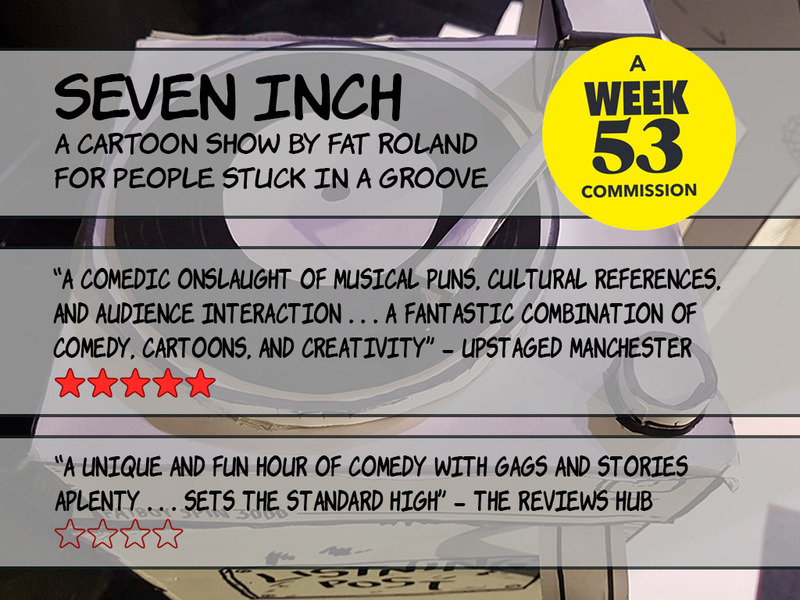 It is clear that Fat Roland is more than familiar with performance, knowing exactly how to get the room roaring with laughter, from start to finish... A fantastic combination of comedy, cartoons, and creativity." Upstaged Manchester's ***** review of Seven Inch. I am available for booking. 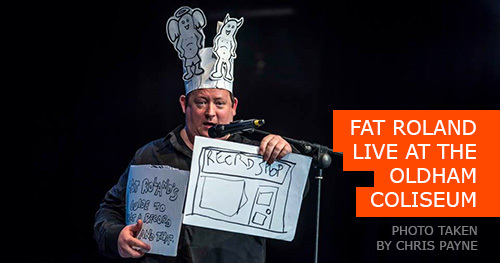 I can come and do a set for you (think Stewart Lee devoured by Johnny Vegas holding a cartoon of Stewart Lee being devoured by Johnny Vegas). I can compere your event (think Stewart Lee devoured by Johnny Vegas announcing that the next act is Stewar-- you get the idea). Or maybe you want me for a talk or discussion or podcast. I've done two shows for the Edinburgh Fringe and a third show (Seven Inch) in Salford. Recent appearances include Manchester Literature Festival, The Lowry, Waterside Arts, Brewery Arts, Royal Exchange and FC United. The videos page might give you more of an idea, or it may not. To get in contact, email me.